According to Philson (Order of Battle for 30.9.1940), No. 1 C.W. Group, consisting of the 58th, 61st and 62nd Coys, came directly under Eastern Command, while Nos. 2 (64, 65, 66, 67 Coys) and 3 (68, 69, 70) Groups were part of Southern Command. At the same time, this Coy was supposed to support the 5th Loyals if that unit occupied defensive positions. Mention is made of “H.E. projector targets” which seems to indicate that the use of gas was not envisaged (initially at least) in what was likely to be a fluid and unpredictable battle situation. So the idea was apparently to make more or less informed guesses as to where there might be concentrations of enemy troops (that could not be reached by direct fire) and then set up (or dig in) the projectors to drop H.E. bombs on them if and when they did show up. As you can see from the note below, the HQ of the Group and the 58th Coy were in the same region. Knouterer - did you by any chance read the Wikipedia entry I provided the link to? The Livens Projector was also used to fire other substances. 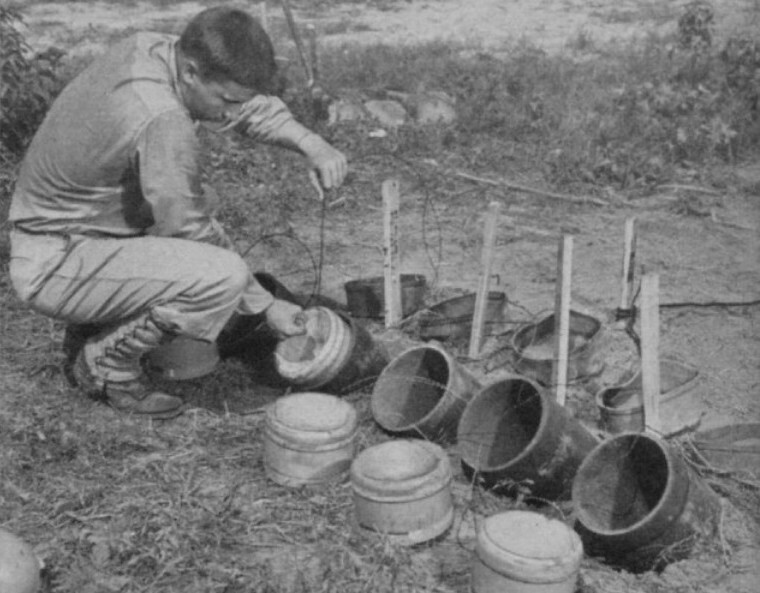 At one time or another the drums contained high explosive, oil and cotton-waste pellets, thermite, white phosphorus and "stinks". Used as giant stink bombs to trick the enemy, "stinks" were malodorous but harmless substances such as bone oil and amyl acetate used to simulate a poison gas attack, thereby compelling the enemy to put on their cumbersome masks (which reduced the efficiency of German troops) on occasions when gas could not be safely employed. Alternatively, "stinks" could be used to artificially prolong the scale, discomfort and duration of genuine gas-attacks i.e. alternating projectiles containing "stinks" with phosgene, adamsite or chloropicrin. There was even a design for ammunition containing a dozen Mills bombs in the manner of a cluster bomb. I don't think so - high explosive (in al its various forms), in the normal sense of the term, is entirely unsuited as a propellant because it detonates too violently. Livens used black powder in his early models and later cordite (see A. Saunders, Weapons of the Trench War 1914-1918 (1999), p. 142-156). So the reference in the note above to "H.E. projector targets" means they were thinking of H.E. bombs, as opposed to bombs filled with gas, oïl or other nasty stuff, although of course those might have been used as well if available. I don't think so - high explosive (in al its various forms), in the normal sense of the term, is entirely unsuited as a propellant because it detonates too violently. Livens used black powder in his early models and later cordite (see A. Saunders, Weapons of the Trench War 1914-1918 (1999), p. 142-156). ...as opposed to spring-powered, or compressed gas etc..
Another thing to remember is that where possible the Army preferred "non-personal" names for equipment - the Army was a great leveller when it came to personal ambitions How often for example to you find references to "spigot mortars"....as opposed to "Blacker bombard"? So the reference in the note above to "H.E. projector targets" means they were thinking of H.E. bombs, as opposed to bombs filled with gas, oïl or other nasty stuff, although of course those might have been used as well if available. There's actually a very broad hint buried in point 4 of that September1940 order Have you noticed it? What assumption??? I'm simply stating a fact. There were no such things as "H.E. powered projectors", nor could there have been, because - as I believe I already explained - "high explosive", in any accepted meaning of the term, can't be used as a propellant because it detonates far too violently. It follows, logically, that "H.E. projector targets" refers to targets for projectors firing H.E. bombs. I can't explain it any clearer than that, sorry. In the meantime, I've had a look at the WD of this CW Group in Sussex in 1940 and it appears that they had stocks of mustard gas bombs as well as H.E. bombs. A problem was of course that setting up all those projectors took a lot of time, far too much in a fluid situation. In one exercise, a CW company was overrun and captured by the "enemy" before they had even finished unloading their vehicles. Yes, you have indeed missed the hint in point 4 of the order you posted up. Knouterer wrote: A problem was of course that setting up all those projectors took a lot of time, far too much in a fluid situation. In one exercise, a CW company was overrun and captured by the "enemy" before they had even finished unloading their vehicles. I'm a bit puzzled as to why they didn't just set up the projectors to fire on the beaches, or rather, a couple of hundred yards to seaward of the beaches. Apparently that was the plan for the other CW company, the 58th, which was to defend Pevensey as mentioned in the note, but the info on that is not very definite - I'll check it again. phylo_roadking wrote: Yes, you have indeed missed the hint in point 4 of the order you posted up. Given that it has been five months since your last hinting post, perhaps you would be kind enough to cease the guessing games and simply state what you think was hinted in that passage? 4. The tasks have been alloted to the C.W. Coys so that they are close to their billeting areas. This is considered important in order to reduce the time and hazards of travel. Oh, so you decided that the phrase "hazards of travel" could only apply to concerns about the H.E. rounds? The hazards of moving troops during an operation where the enemy has air parity or better? The hazards of moving troops during an operation where the enemy may have air landed troops? The hazards of moving on country roads with congestion slowing the movement of the troops? The hazards found on all roads when moving, such as vehicle accidents, flat tires, breakdowns, and the like? ..about distance on the ground - nothing else. phylo_roadking wrote: ..about distance on the ground - nothing else. Thanks, I never realized that the phrase "hazards of the road" only applied to CW units, its CW weapons, and the distance it must traverse on the ground. Rural customs of discourse, such as feigned ignorance, pettifogging, playing at peek-a-boo, fact-free repartee, redundant and uninformative posts, and/or "stonewalling" denials of facts well-known to most informed persons, are strongly disfavored here.